The club supports several running races each year around town and in the local mountains. We provide communication for the race such as reporting lead runner status, requests for medical help, and more. The races provide an excellent way to develop and improve communication skills - test our equipment - and develop new radio operators. 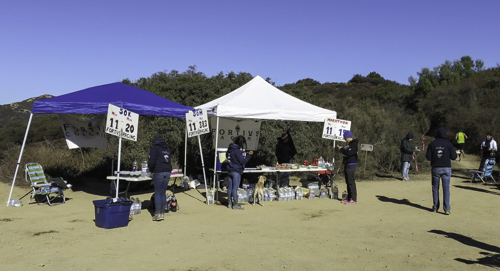 Race support is typically done with hand held 2 meter radios, although some aid stations benefit from or require the additional power of a mobile rig with a high-gain antenna. For races in the mountains, we put up a temporary repeater to relay messages from aid stations located in canyons. Please come help at the races. More operators make the work easier for everyone. Training is available and you will be assigned a location consistent with your desires, experience, and equipment. It is fun and it really helps the community see the benefit of Ham radio, as many stations have no cell phone coverage and we are the only path for getting help when it is needed.